There are two methods of DRF submission: Online i.e. through site and Offline i.e. at respective SDSC office. Manual DRF Entry i.e.offline DRF entry is provided for SDSC. 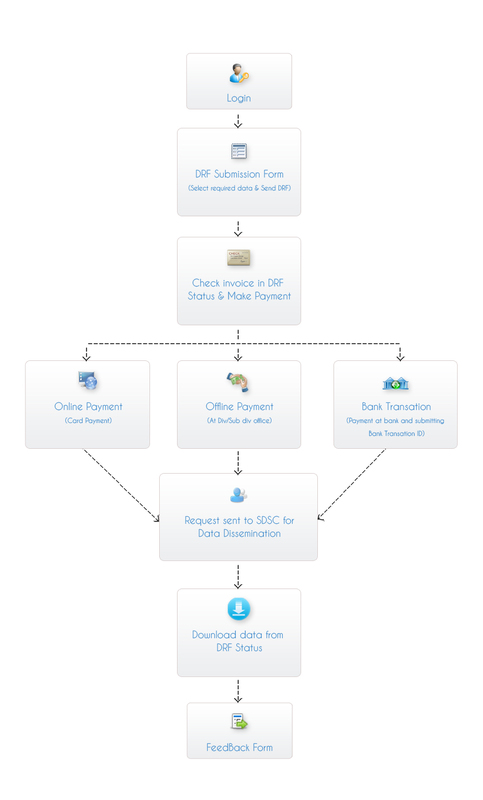 Member can fill the DRF form at SDSC office, make payment and get required data. Member can also send a DRF by logging into his user account and clicking on DRF Submission right side menu tab. Read the general instructions & click continue. Search, select and add the required data, select purpose, read agreement and send DRF. Status of DRF can be monitored continuously on DRF Status page. a). Online Payment – Card payment via BillDesk Payment Gateway can be done at Online Payment link on Make Payment page. b). Bank Transaction – Make payment in bank, get bank transaction id and submit it so as to make payment through Bank Transaction. c). Offline Payment – Payment can also be done at the nearby Divisional/Subdivisional office. Confirmation of payment will be done at SDSC after which required data will be disseminated to the member. Data can be downloaded on member side at DRF Status page. Data will be available for download only 15 days from 'Date of Data Download'. After data download, member can fill a feedback form to rate the service provided for further improvement.